The purpose of the CARE program is to work one-on-one with Familia Unida members. The CARE program objectives are to focus on providing supportive services such as counseling, referrals and advocacy for those with disabilities and their families. By forming a personalized bond with our members, this program is able to identify the real issues affecting individuals and/or their families. 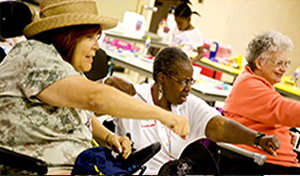 by providing supportive services that enhances their quality of life. We are able to empower our clients to be proactive in their choices related to their health, social service needs and receive a better understanding of their human and civic rights. 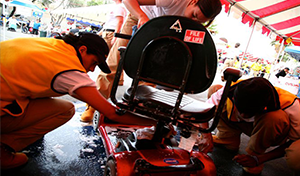 We also provide additional support to community resources, educational speakers and socialization is experienced at the Monthly Support Group Meetings, Kids Corner, Community-Health-Employment Outreaches, one-of-the-kind - innovative Wheelchair Wash Event that hosts over 2,000 community members during the celebration of the Americans Disability Act. The FUES program belongs to the Employment Network, which is comprised of national partners’ collectively working to find employment for the disabled. The FUES is a cooperative agreement based program between Familia Unida and the Social Security Administration. 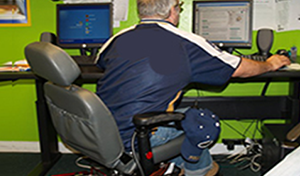 The primary goal is to assist qualified disabled individuals in receiving SSI or SSDI benefits to find appropriate jobs, promote and, educate employers. We believe that people with disabilities have many abilities and skills which merit successful and gainful employment opportunity. The delivery of services ranges from conducting an individual work plan, intake of skills, evaluation of skills/disability, providing assistance with reaching a realistic goal for finding the best employer-employee match, job research, resume building, job coaching, interview tips and linkage to other supportive services in the community that will assist in the transition from not working to becoming gainfully employed. The goal of the HAPI Program is to bridge fun innovative health access activities that are inclusive of the family while incorporating laughter, play therapy, exercise, expertise speakers, resources, educational materials/handouts in a manner that is in appropriate language, respectful, culturally sensitive and providing tools for long-term support that they can share with family members or refer to for maximum results. We encourage that "knowledge is power" and reinforce the importance of communication and sharing of lessons learned and strengthening supportive services ties with family and friends for ultimate results and continued support. The goal of the LOVE Program is to provide mentorship, work experience, or recieve expertise consultation from a diverse socio economic individuals/groups within the Southern California region. Through a competitive process, Cooperative Agreements are made with local Universities, students representing USC, UCLA, Cal State Universities, Local High Schools, Senior Citizen Organizations, Expertise Consultants and the Disabled Community. Participants in this leadership internship program commitment to a minimum of 15 to 25 hours a week. 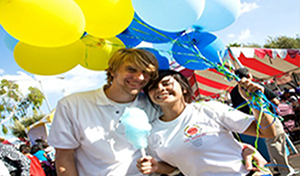 We embrace participation from different cultures, ages, genders, disabilities and languages. We have found that our cross culture service model that is inclusive of the engagement of our community has been a transformational positive experience for all concerned that reinforces our mission of sharing LOVE that is contagious! Copyrights © 2017 All Rights Reserved by Familia Unida.